This innovative programme, the first of its kind, uses a unique formula of fly fishing, counselling, and medical advice to promote mental and physical healing to women whose lives have been profoundly affected by breast cancer. The focus is very much on moving forward. The programme, run by The Countryside Alliance Foundation, has visited Mount Falcon many times and dozens of Irish ladies can testify to the therapeutic fun involved in attending a retreat. The retreat will be held at the Mount Falcon Estate from 13-15 May. Any woman who has experienced breast cancer is eligible to apply to attend a retreat (with medical clearance from her doctor). The retreat will take place over two-and-a-half days and all accommodation, meals, counselling, and professional instruction are provided at no cost to participants. 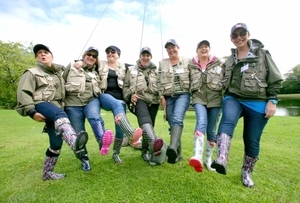 Fly fishing is a gentle exercise which requires no strength and is exactly the sort of activity in which recovering breast cancer patients can participate safely. Fly fishing also offers those on retreat a chance to reflect and escape in tranquil surroundings. Casting for Recovery UK & Ireland began in 2006 and by the end of 2015 more than 450 women had benefited from the programme across the UK and Ireland.